This picture is of Lydia's and my wrist, with purple hearts drawn on with a purple Sharpie marker . She was pretty sad before I left for my last work trip, and I read somewhere in blog-world about someone doing something similar for their child that was missing them during the day. I drew the hearts so she had a visual reminder that I was thinking of her, and carrying her with me all the way to Canada. The hearts faded, but Bo was great and re-drew her heart for her each day until I came home. 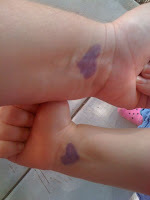 The picture of her little wrist with the heart is my iPhone wallpaper right now. We are thrilled at the chance to attend the latest Disney Live show -- Mickey's Magic Show -- in just a couple weeks here in Phoenix. The show will feature a variety of magic tricks, including the Fairy Godmother turning Cinderella's rags into a beautiful dress! I know Lydia will be entranced, and I'm sure the boys will have a good time as well. Mickey's Magic Show will be in Phoenix only on October 16 and 17, 2010. Tickets are available through Ticketmaster. You can see a quick video of the fun at the Disney Live website. I have a great discount for my readers! If you use the code MAGIC at Ticketmaster, you can get $5 off all tickets (except VIP and Front Row.) This is the deepest discount being offered - - exclusively for blog readers! I hope to see you at the show, or hear about the fun you had. I know Lydia can't wait to see her princesses! Have I mentioned our new floors? Okay, I know that I have! One of the things that I love about having only laminate and tile (just 2 more rooms to do!) is that we won't need a vacuum cleaner anymore. 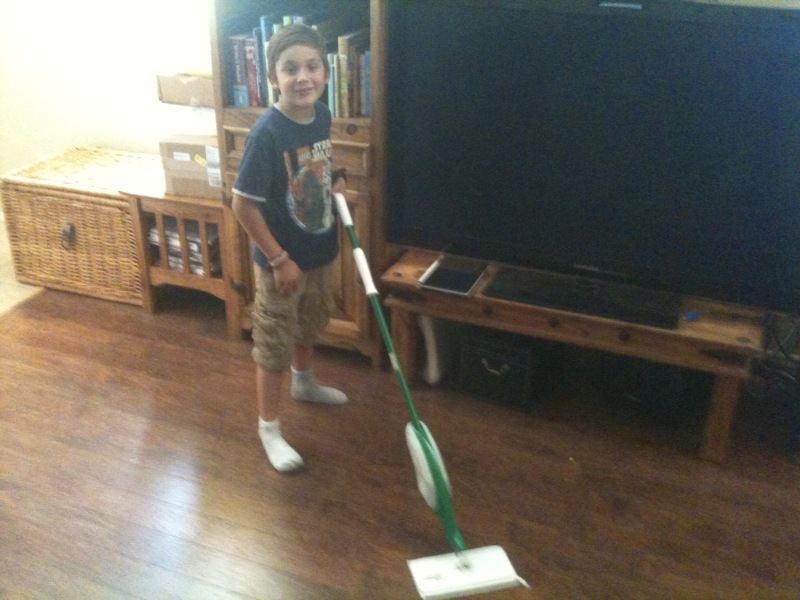 Libman sent me one of their Freedom mops to try out, and the entire family loves it! You can see Nate using it in our living room. What you couldn't know unless I told you, is that he picked it up and started using it with absolutely no prompting! He saw the mop, grabbed it and tried it out. When I asked him what he thought, he said it worked pretty good. What I like about the Libman Freedom Mop is that the microfiber cloths that attach to the bottom can be washed in the washing machine, which means I'm not creating more garbage. I also received an extra pad , so when one is in the wash, the mop can still be used. The other thing I liked is that the spray bottle can be filled with whatever cleaning solution I choose -- vinegar, water & a bit of essential oil gets the job done! But, the real question is: How does it work? I'm happy to report that it does a great job on both our tile and our laminate floors. The spray nozzle spreads the cleaning solution in front of the mop and the microfiber pads do a great job of scrubbing the floor. I'm also happy using it without the spray in areas like the living room and hallway just to get the dust off the floor. It's also easy for kids to use! It's lightweight and both boys have no problem using it when their chores include cleaning floors. These mops are made in the USA by a 4th generation, family-owned company. As well as trying to be green whenever possible, we also try to buy USA-made whenever possible! I have to mention again how it is eco-friendly since you don't have to purchase brand-specific items as refills, and the pads are fully washable (company information says at least 50 times). I can see the Libman Freedom Mop lasting a long time! Visit their website for a $5 rebate on the Freedom Mop, or visit their Facebook page to see what promotions they are currently running. You'll find the mop in most major retailers for a MSRP of $19.99 - $24.99. Mandatory Question: Tell me what cleaning job you dread around your house! It's been a busy few weeks around here. I had the opportunity to travel to both Cedar Rapids, Iowa and Vancouver, British Columbia in the last 2 weeks to provide training, as well as teaching classes locally every day I wasn't traveling. It was great seeing 2 cities I had never visited before, and I wish I had the chance to do some sightseeing while I was there! Bo has been very busy around the house as well. He was struck by a remodeling bug apparently, and has been updating our 9yo house like mad. I mentioned our newly remodeled bedroom a while back, but since then he has also torn out the living room floor and replaced it, torn out the carpeting in the hallway and replaced it with laminate, finished the archway into our office, painted the hallway, and is in the process of remodeling the 2nd bathroom. He has painted, replaced fixtures, and is in the process of replacing the vanity as well. It's going to look awesome in there when he's done! There's even talk of replacing our kitchen island. Everyone always asks about the kids when I travel, but the kids do just fine. We have always had a strong family bond and Bo has always been extremely involved with our kids. While I know they miss me, they also miss Bo when he travels. I have no worries when I travel and Bo is the primary caregiver as he is an awesome Dad. There are no silly jokes around here about Dads who don't know how to cook, or clean, or get the kids to bed. He does it all. Of course, it's always easier when we're both around to handle it all, but we're both perfectly capable of picking up the slack when one is gone. I don't have any trips on the horizon, so I know that I will be doing some of the behind the scenes things that go along with remodeling -- like cleaning out cupboards and organizing. We had our home built 9 years ago, and moved in October 2, 2001. I'm excited about the changes we're making to update things a bit, and glad that we're able to get them done. Colin hates to have a runny nose, and he's prone to sinus infections. When we had the chance to try out a couple of the new products in Waterpik's Sinus Health line, I wasn't sure if he'd be willing to squirt saline solution into his nose and let it drain back out. The discomfort of a stuffy nose won out, and he was a willing participant in testing out the SinuSense squeeze bottle and the SinuSense neti bottle . I'm still surprised he did it, but I did it as well so I knew it wouldn't be awful. He has used both the squeeze bottle and the neti bottle a few times over the last month, at his request. He prefers the neti bottle, as the flow is slower and easier for him to control. They have provided him with relief, and it doesn't involve any OTC medication, which I like. I'll admit that I have read about how great neti pots are for quite a while, but was never willing to try one before. Now that we have, I know we'll continue to use them! Just because the boys are attending public school these days, doesn't mean that we don't continue to find the lessons in living life. I am always on the lookout for good supplements, and was very pleased to learn about the magazine, KNOW. The magazine is geared for 6-9 year olds and are all about science. The science programs at the boys' school is pretty weak, which made me even happier to learn about this magazine. Each issue (published every other month) is packed with articles about scientific theories, facts and experiments. The reading level is perfect for 2nd - 4th graders while being engaging and interesting. Colin is usually ready to read anything he can get his hands on, but Nate was also interested in reading the sample magazine we received and enjoyed it! This magazine depends solely on subscriptions and does not have any outside advertising. Subscriptions would make great gifts for all the young scientists you know -- especially with the holidays only a couple months away. Sometimes, (okay, I confess -- a lot of times), I need quick, easy food that I can give not only to my children, but also myself. I will also confess that I don't really like crusts. I do like peanut butter and jelly, though, so I like the ease of Uncrustables. Smucker's Uncrustables are perfect for those days when we want to run out to the zoo or botanical gardens. I can pack them, and they're ready to eat by lunchtime. Most Uncrustables have peanut butter and jelly, but one version has peanut butter and honey -- which is good for the child that doesn't like jelly. Another new product from Smucker's are Snack'n Waffles with flavoring that only require 15 seconds in the microwave! Mornings are pretty hectic around here, so something that can be popped in the microwave for 15 seconds and then eaten out of hand is welcomed some days. We've kept a box of Uncrustables in our freezer for a long time now, but I think we'll also be adding a box of Snack'n Waffles! This is the face of Nate's stutter. 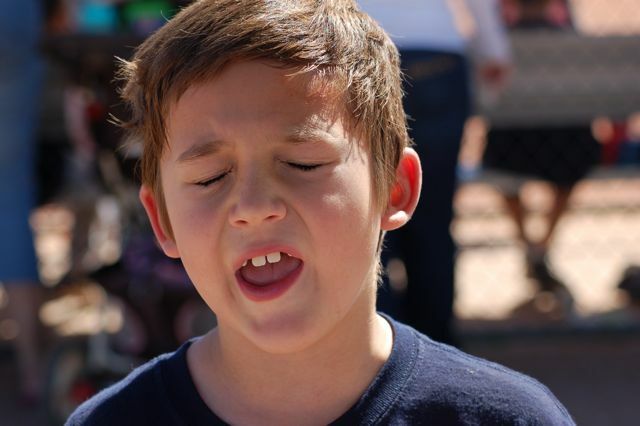 I was snapping pictures at baseball on Saturday, and caught Nate mid-stutter. The picture doesn't adequately express the physical strain his stutter puts on his upper body, but you can begin to see the strain around his eyes and some around his throat and mouth. His stutter is more than just his speech. On the worst days, it's a physical struggle that takes a toll on his young body. He's working with the same speech pathologist as last year, but instead of the solo meetings of last year, he is with a group of 3 other children with different speech impediments. I don't see much progress since he has returned to speech therapy, and I think it is partly because of the lack of individualized attention and partly because of the adjustment of going to school. He has shared his frustration with me that he doesn't have as many opportunities to practice his speech this year because of the group setting. I'm beginning to formulate some plans to get him additional help, but until then we'll continue to listen patiently, educate others, and remind him to breathe. It's a constant struggle for him, and this picture begins to share some of that struggle. 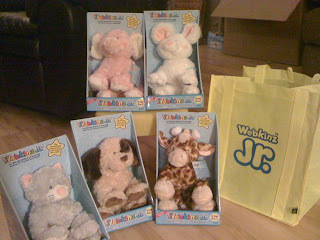 A few years ago, my boys enjoyed the Webkinz stuffed animals and the computer games that went along with them. They have outgrown stuffed animals (but not computer games), but Lydia currently has quite a few favorite "honeys" (aka stuffed animals.) 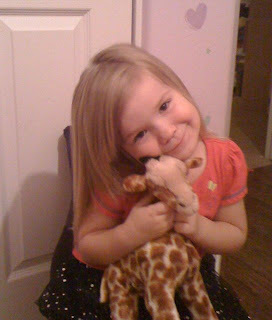 When we were offered the chance to throw a Webkinz, Jr. party with a few of her friends, I was happy to accept. 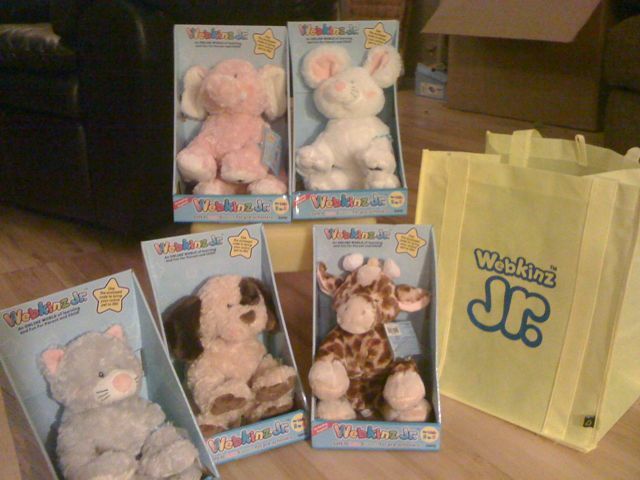 We received a selection of the stuffed animals , fun music CD's, coloring books and information about Webkinz, Jr . These animals are super-soft and cuddly! Even if they didn't include an online world, they would be a great buy. Lydia chose a giraffe for herself, and promptly named him Cesar. I did get some feedback that the age range they were geared towards (3 - 6) might be a little young for online games. You've probably seen how proficient Lydia is with our iPad and her iPod Touch, so I didn't worry about that for her. In fact, one recent afternoon when the boys needed help with their homework, she was happy to sit and play with Cesar in his online world. When we first set it up, we played together clicking through to different areas, and then she also has played when I was nearby but not actively with her. The online portion is not required, but adds to the fun. Each animal comes with a special code that allows you access to their online world. The code knows what kind of animal it came from, so the online pet matches the IRL pet. Parents are required to set up the account, and there is also a parent area with information. Lydia didn't explore as much as I remember the boys exploring when they were first introduced to Webkinz, but she definitely had fun clicking around and making her animal move around and check out his environment. I also realize that she is on the low range of the suggested age range, and imagine even in another year she'll be more proficient. The kids we shared the toys with had them in their arms as soon as the packaging was removed and had a great time naming them and playing with each other. I took some time to share the online portion with the moms that attended, and they were impressed with the quality of the graphics, and the ease of play. The kids were most excited about the snacks, and dancing to the music with their new friends. I would definitely recommend these animals as gifts for young children. The quality of the animals is superb and the online world adds to the fun! We want to thank Mom Select and Webkinz for letting us share the fun with some of our local friends!! Everyone had a great time! For a while (at least a year, probably longer) we have talked about removing the rest of the carpet from our house. Bo replaced our living room carpet with laminate 3 or so years ago and we have been happy. He's had a little extra time this week, so he got started. He started with Lydia's room and it looks great. 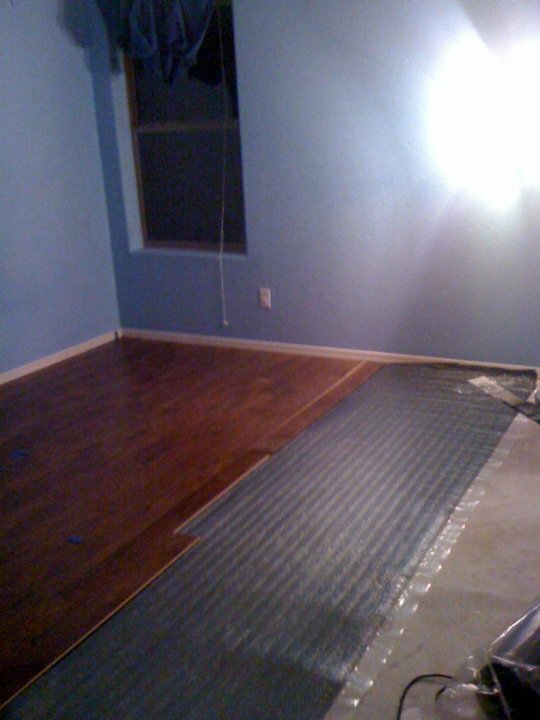 It took him about a day -- that was removing everything (including emptying the closet we hadn't really looked at in about 8 years), ripping up the carpet, laying the laminate and putting everything back. I think the dark tones look awesome with her lavender walls. We also took this opportunity to move her from a toddler bed into a twin bed -- which she loves. Today, he started on our bedroom. We emptied it out, he ripped up the carpet, and is still putting the floor down. I think he has lost some steam for the project now that he is into it for 2 rooms. We have a busy weekend ahead, so while I know we'll get our room back together before Sunday night, I'm thinking that the boys' room and the hallway will probably wait a few weeks. I may be wrong . . . but it's okay if they aren't done next week. I'm thrilled with the progress, and I know we have the laminate for when he's ready to tackle the back of the house! I am so happy to be rid of the carpet. Between 2 dogs (not at the same time) and 3 kids we had plenty of pee and juice stains on the carpet. Even though we did our best to clean it, when we had to look at the bottom of the carpet, it was gross. I don't know how anyone could rip up carpet and then replace it with more carpet -- knowing how filthy it becomes. I look forward to the ease of keeping laminate clean vs. wall-to-wall carpeting! Both Nate & Lydia love a good salad. I like to buy baby spring mix, so the lettuces have some nutritional value. (I always remember learning that eating iceberg lettuce was the nutritional equivalent of eating a paper bag, so I try to make better choices.) When we eat out, servers are often amazed that the kids eagerly eat salad. I sent Bo over to the school at lunchtime yesterday so he could check it out. The "salad bar" at our school has a variety of cut up fresh fruits and vegetables, as well as applesauce (or another canned fruit according to Colin) The school also offers a chef salad as an alternative to the hot meal of the day that can be chosen from the main lunch line. We've encouraged Nate to visit the salad bar once in a while, but I know he still eats plenty of salads at home (in fact, his snack before bed last night was a big bowl of spring mix with a sprinkling of walnuts and Annie's Goddess dressing ) I think every school should have a salad bar, so I encourage you to check out the Salad Bar Project for yourself and see if you can help put a salad bar in a local school that doesn't currently have one. A month or so ago, someone on Twitter mentioned the Phoenix Cooks event. I had never heard of it before, but headed over to their site to check it out. It looked like so much fun I bought tickets for Bo & myself to go. 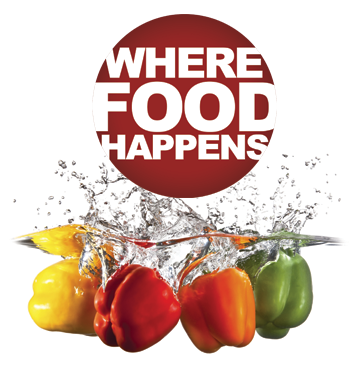 The event is this Saturday, and I am looking forward to spending the day seeing, smelling and tasting what some of the best Phoenix chefs are making these days. I'm also hoping to pick up ideas, new recipes and even some new techniques while we're there. I didn't purchase any of the extra cooking classes, but there are 4 kitchen stages available to everyone attending the event, where chefs will have demonstrations going all day. Bo is the more adventurous cook in our family. If it was up to me, I'd make and serve the things I know everyone likes and that I know how to make without a recipe. Oh, and that are also simple, fast, and easy to clean up. Bo is willing to try new things and shake up our meals with different recipes. (I'm pretty lucky.) Maybe some of these chefs will inspire me, though! Who knows, maybe I'll start a food blog next! I have a friend who has stenciled various quotes on her walls, and while I think it looks amazing, I've never had the patience to do it myself. When Rebecca from Quote the Walls contacted me, I was excited to review one of the decals she offers. There are many quotes available on her website, but I was most interested in the custom decals that you can order. If we're friends on Facebook, you know I love quotes. I thought about a few different quotes that I would want my family to see over and over again, and finally chose the Dalai Lama quote "Be kind whenever possible. It's always possible." Kindness is a trait that Bo and I do our best to encourage, and I thought it was a good reminder for anybody. The ordering process was easy. I chose a font, size and a color for our decal. Once ordered, it showed up on our door in about 2 days. We've been busy, so it sat in the box a few days before we had a chance to put it up. I wasn't sure how difficult it would be, so I decided I would let Bo put it up. I also decided I wanted it above the arch in our kitchen, so I needed him to stand on the stepladder. He had a free hour today, so he took it out and figured out how to put it on the wall. It took him about 10 minutes to line it up, and place it on the wall. That's it! It was so simple, and I think it looks amazing. Rebecca has generously offered two of my readers a $25 gift certificate to purchase their own decorative decal. Check out her website for all the different designs. Mandatory Question: Visit Quote the Walls and tell me what decal you would purchase with your gift certificate. If you want to enter the giveaway, click through to the giveaway form. The form keeps track of all of your information, without exposing your information to the Internet. I always delete the entries after submitting the winner's information. Comments left on this entry are not entered into the giveaway. For all my giveaway rules, check out this page. The giveaway ends on September 15, 2010.